Chamber of Indian Micro Small & Medium Enterprises [CIMSME], is instituted to recognize and reward individuals, professionals and banks who have been supporting in rejuvenating the MSME sector by making available financial assistance to millions of people. 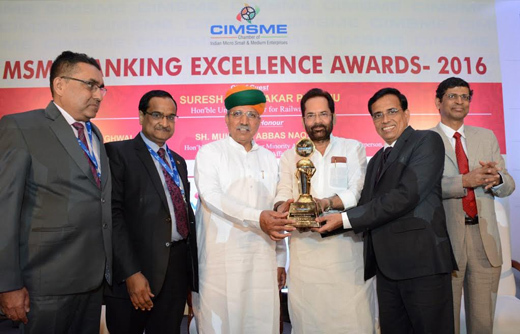 Shri Raghurama, General Manager, of the Bank received the awards from Shri Arjun Ram Meghwal, Hon’ble Minister of State for Finance and Corporate Affairs, and Shri Mukhtar Abbas Naqvi, Hon’ble Minister of State for Minority Affairs (I/C) and Parliamentary Affairs, Govt. of India, on April 20, 2017 at New Delhi. “This is a very special award for the Bank. Bank’s relentless efforts to distribute part of its surpluses for the common good of public, especially the marginalized sections of the society and its active participation in implementing various government schemes for the poor have been suitably rewarded in the form of this coveted award. It is also a momentous occasion for us to affirm that the Bank will continue to grow as a socially responsible business entity”, said Shri Mahabaleshwara M S, Managing Director and CEO, of the Bank.